Test procedure: I generated a 720x480 test pattern in Photoshop and sent it via firewire to the TRV900. Yes, the guy squinting at upper left is me (sorry, I didn't have photos of any more attractive models available.) It looks slightly stretched horizontally, but remember that DV pixels are not square, so this image appears on your computer monitor 1.125 times wider than it does on a TV. Conclusions: You can download each image to your computer and use a slide show program (eg. ThumbsPlus) in full-screen mode to flip between them and compare. The most obvious difference is a slight overall brightness/contrast difference, and in the brightness of the saturated red area. The resolution patterns and the photo image seem essentially identical. There are a few scan lines with some kind of noise (head-switching noise?) near the bottom of the image but it is outside the frame of a normal monitor or TV so I usually never see it. The SVHS mode does capture more detail, as expected. 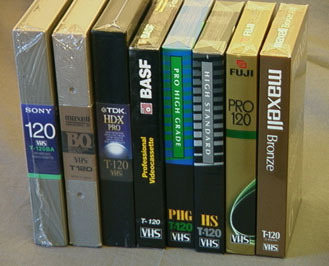 I was not impressed by the difference in image quality between any of these tapes in VHS mode. It is possible that the number of dropouts, liklihood of tape stretching or jamming, or other long-term durability factors are different. 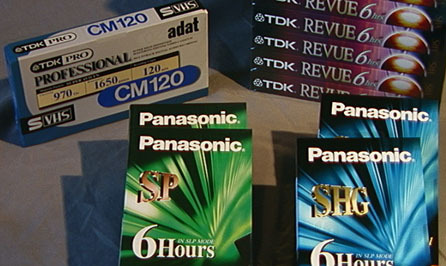 But as far as I can tell, the $0.99 tape performs just as well for VHS recording as the $15 version. [12/9/00] Later note: I am coming to believe that one of the things I did not measure in my tests, namely dropouts (image noise and weak/no video signal, due to inconsistencies and weak spots in the magnetic tape coating) are worse with the cheaper tapes. [5/28/01] Most recently I have been using Maxell "Gold" T120-HGX and Fuji T-60PG tapes which have been good, as far as minimal dropouts that I've noticed. 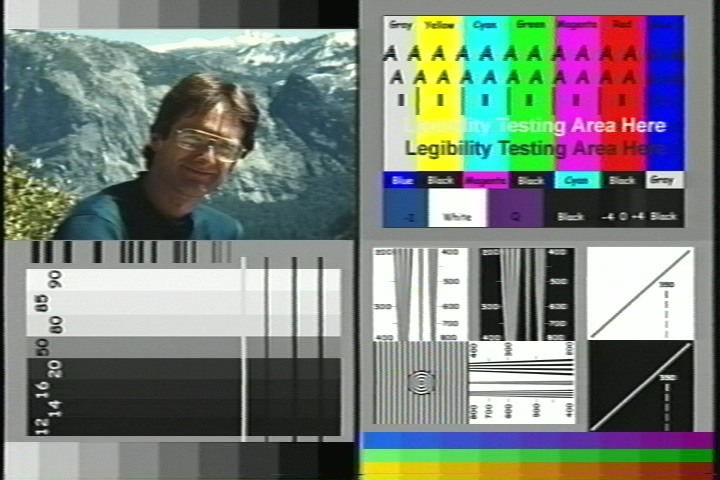 Otherwise, image quality is the same as any other tape.